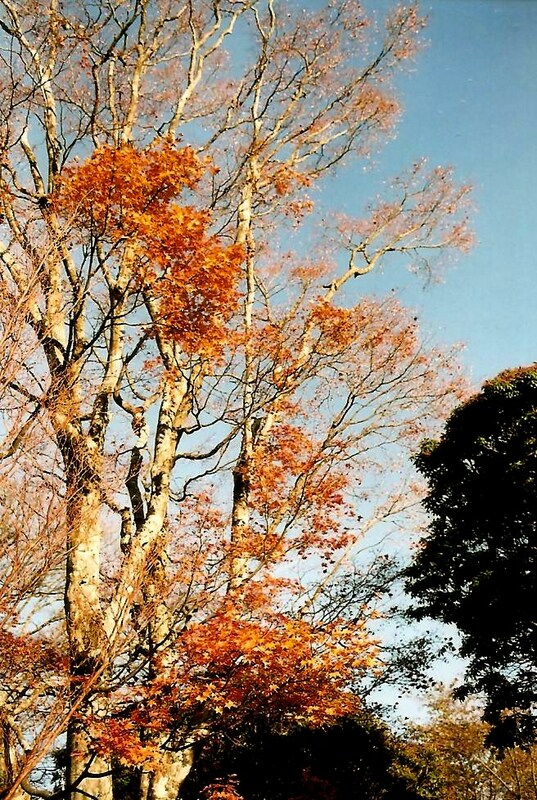 The autumn colors naturally fluctuate from year to year. Sometimes they come on in one fell swoosh at the beginning of October. Other times, they slowly morph into fiery reds and sunshine yellows. 2005 was a particularly slow year for the foliage, as colored leaves could still be seen against a backdrop of Christmas reds and greens. 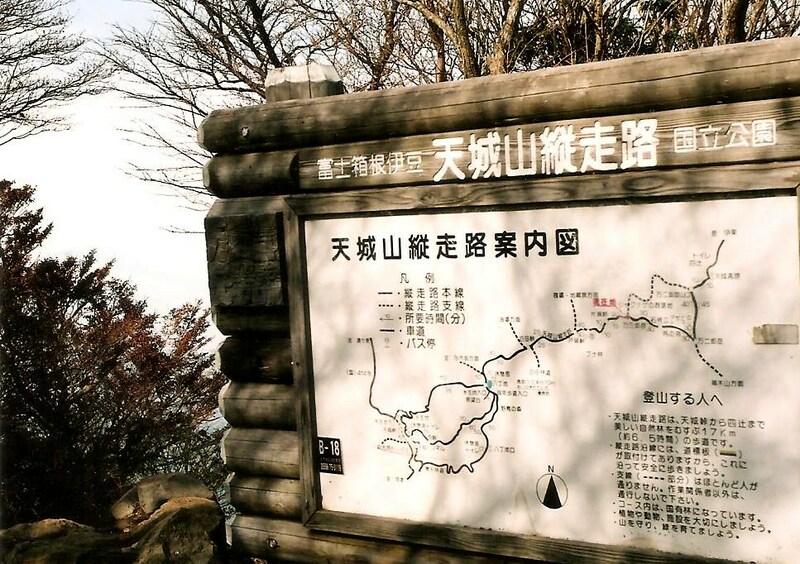 So here I was in mid-December, heading to the middle of Izu Peninsula to knock off yet another peak, the last on my list that could be done as a day-trip from Osaka. I boarded an early morning Hikari bullet train for Atami, where the local JR line headed south to Ito station. 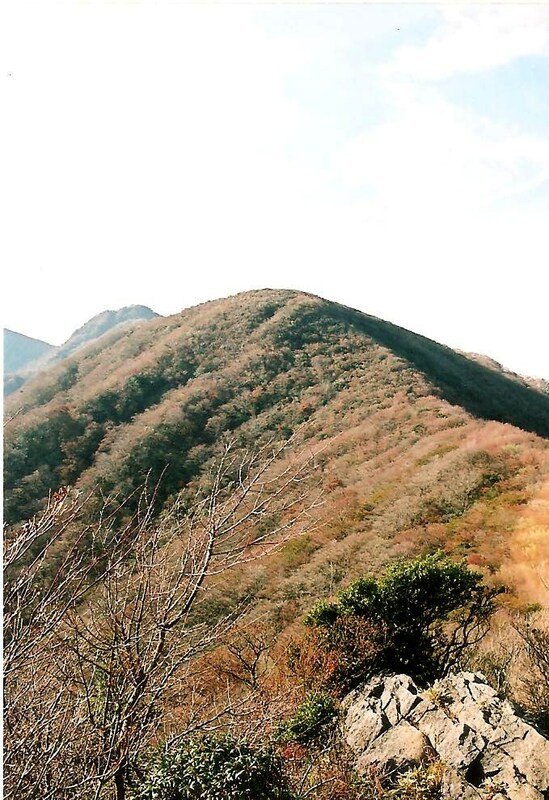 The sun shone brilliantly in the early winter air, as Mt. 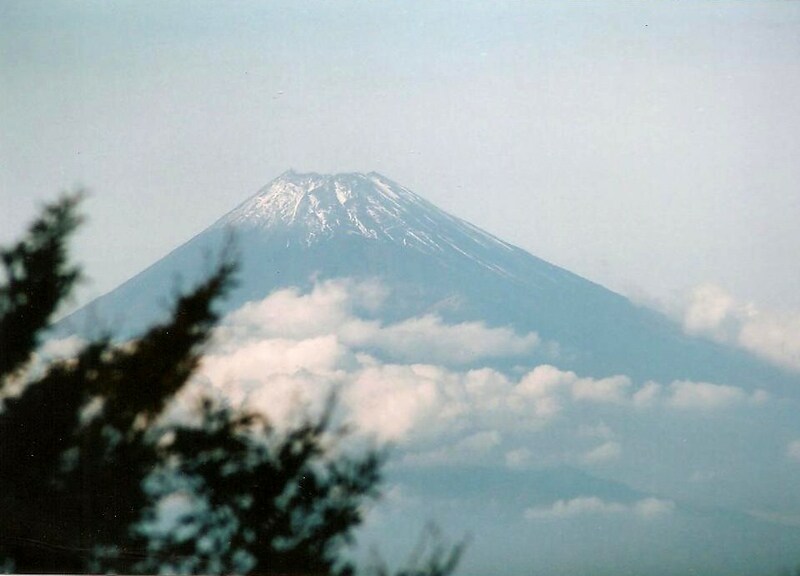 Fuji sported a short white cap of fresh frozen ice. Once off the train, I searched around for the correct bus that would take me to Amagi-kogen. Luckily there was a bus attendant that sorted things out for me and I soon found myself with a handful of other tourists in search of the autumn colors. Once at the trailhead, I filled up on water before diving into the forest. After dropping to a col, the path climbed up and around the neighboring golf course towards the ridge, which I gracefully reached in a fraction of the time the maps had allotted. The 200-meter vertical elevation gain was anything but challenging after the previous month’s tough assault of Mt. Ena. The heavily-forested summit of Mt. Banjiro afforded no views of the cone, but as the trail dropped to the long saddle below the high point, Mt. Fuji’s elegant figure came into view. Autumn and winter are generally the best times to catch Fuji in all her glory, so I silently thanked myself for holding out on Amagi for this long. I could have easily squeezed the mountain in around the beginning of September, but patience surely paid off this time around. Continuing along the ridge, the final summit climb loomed. Again, the maps said to allow 50 minutes to reach the peak but it took less than 30. Just as at Banjiro, the target peak of Banzaburo lay thick in a grove of broadleaf trees. Glimpses of Japan’s highest peak could be seen between the bare branches, but nothing compared to what can be seen on the hills surround the Five Lakes of Fuji. I took a quick summit photo and retreated excitedly back towards Banjiro and the golf course. I could have easily looped around on a different course on the other side of the peak, but the trail was roped off, so I opted for what Japanese call the piston approach, which is climbing and descending via the same route as in the motion of the namesake engine component. Once back at the parking lot, I had about 45 minutes to wait until the next bus, so I killed time by sitting under the foliage of a maple tree. Despite the splendid weather and vibrant foliage, the parking lot was nearly empty, a throwback to the days when hiking was an activity only embraced by elderly pensioners. My how times have changed…..